To meet more clients demands for addressable white led strip, now we using smd 5050WWA LED to instead of 5050 rgb led.and using ucs1903 & ws2811 IC driver to control it. 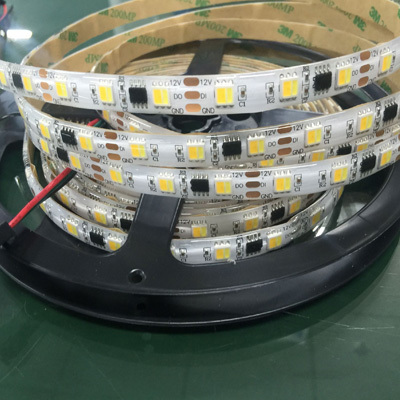 Besides, the led strip support 5v, 12v with wwa leds customized service. 5050WWA LED is a type of 3 different white color chips CCT dimmable LED. These SMD LEDs are packaged in the industry standard CLPP6 package. These high-reliability and high brightness LEDs are designed to work in a wide range of environmental conditions and are ideally suited for use in illumination applications. Their wide viewing angle makes these LEDs ideally suited for channel letter,or general backlighting and illumination applications.